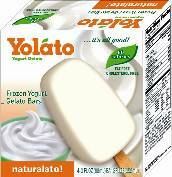 I bought these frozen yogurt bars and they are delicious. Yolato. They taste just like Pinkberry. One bar has 80 calories and 0 grams of fat. According to their website, they have a few stores but they're only in the New York area. So I'm not sure if these bars are available just here or nationwide. Check your grocery store!